JOB DESCRIPTION: Planetary geology is a branch of Earth Science concerned with studying space bodies (e.g. planets). Geologists study pictures of space in order to understand how planets were formed, their climate and topography. They also work with objects collected on space missions. 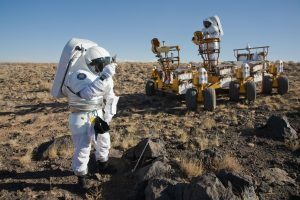 Planetary geologists do not go into space and instead work in offices and laboratories in places such as universities.